This is part 6 in Cheryl’s New Zealand series. To view the other five pieces: one, two, three, four, five . Taranaki once lived with the other mountains of the central North Island: Tongariro, Ruapehu and Ngauruhoe. Unfortunately, Taranaki fell in love with a pretty hill called Pihanga, who happened to be the wife of Tongariro. 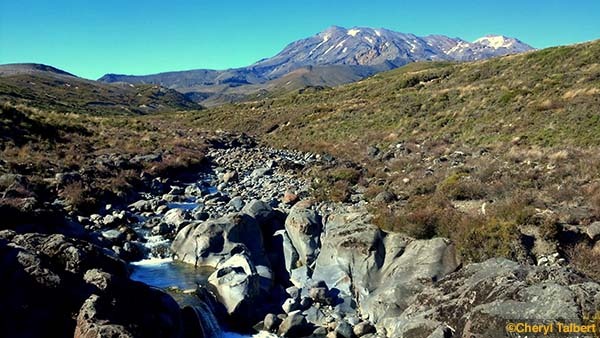 After a fiery battle with Tongariro which he lost, the tall and handsome Taranaki, like many a young man, headed west. His falling tears at being banished are said to have created the deep gorges of the Wanganui River as he gouged a path to the western coast of the North Island. 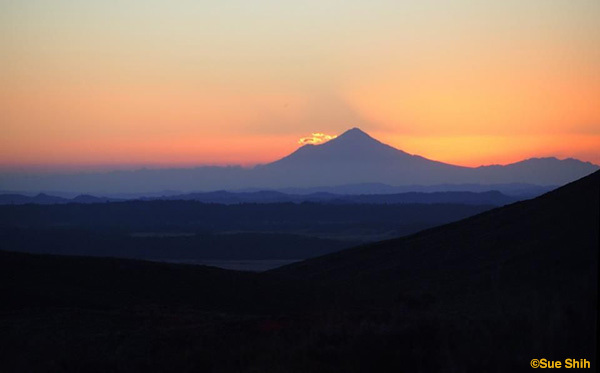 When Taranaki conceals himself with rainclouds, he is said to be crying for his lost love, and during spectacular sunsets, he is said to be displaying himself to her. Tongariro’s eruptions are said to be a warning to Taranaki not to return. Little bitty me, Great Big Mt Doom! At first the lava-rock towers on either side loomed above us, opaque and black before the backdrop of the night sky. There, just to the west, we could barely make out a perfect cinder-cone of a peak, Mt. Ngauruhoe (Now-roo-HO-ee), for the moment just a shadow on the blackness. Then the barest blush lit the edges of the landscape, the sky transitioned to dark purple, and shadows from the lava rocks pointed like fingers toward Ngauruhoe. The mountain began to glow like a hot ember in a wind, first light salmon color, then fuschia, then bursting into flaming orange. To the east and south we could now see over the dropoff from the volcanic plateau where we stood, down to a vast river-cut plain, speckled with lakes and podocarp-broadleaf rain forest, the Kaimanawa Range rising beyond. Massive Mt. Ruapehu (Roo-ah-PAY-hoo) loomed to the south, capped with snow and ice, its broad and tortured outline unashamedly proclaiming its long violent past. 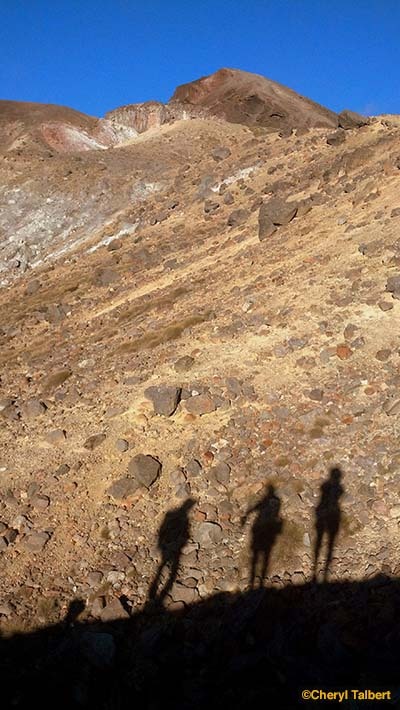 It was early March 2013, late summer in New Zealand, and we were bisecting Tongariro National Park in the center of the North Island on the Tongariro Northern Circuit Trek – a rugged 35-mile volcano-fest and one of the country’s most unique “Great Walks”. 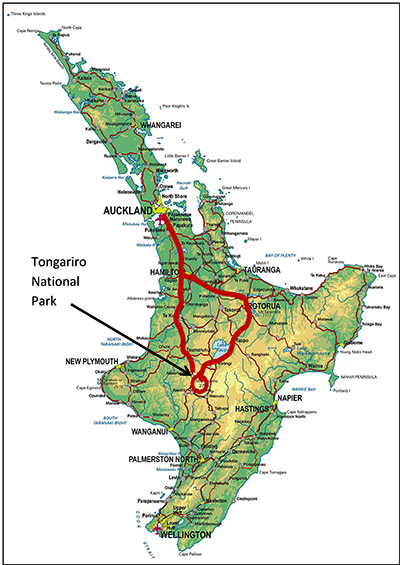 Only the fourth national park established in the world, Tongariro sits at the south-west terminus of a 1600-mile-long string of volcanoes on the boundary of the Indo-Australian and Pacific plates, on the Pacific “Ring of Fire”. 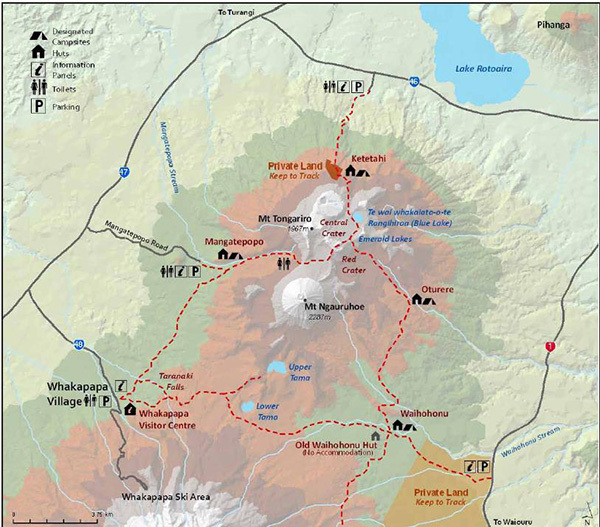 The boundary of the park encircles the active Ruapehu, Ngauruhoe and Tongariro volcanoes, with two smaller dormant cones outside the park just to the north and huge Mt Taranaki in view 130 miles to the southwest. So active are these volcanoes that the track we were walking had been closed for most of the four months before our visit, with one of the nearby huts partially wrecked when chunks as big as a meter across were flung a mile or more from the vent of one of Tongariro’s old craters in November 2012. Mt. Ruapehu has erupted or threatened to erupt in 6 of the 7 years since 2006, and Ngauruhoe has erupted 45 times in the 20th century, most recently in 2012. Not surprising that one section of our circuit was regularly marked with signs reading “Warning: Volcanic flying rock zone next 700 meters. Do not stop.” Motivation indeed! We had started this, our last of seven treks in a month in New Zealand, from the historic Bayview Chateau hotel, a classically elegant 1929 dark-wood-and-velvet edifice perched on the lumpy lava slopes of Ruapehu looking across the plateau to Ngauruhoe. There were only five of us left of the thirteen intrepid friends from the Mountaineers who had explored the south island over the previous three weeks. The Northern Circuit set out with little fanfare from a residential street and wound through rolling subalpine scrub and tussock, alternating dark mountain beech and umbrella fern forest and sunny open views of the volcanoes. The tumbling Wairere stream provided a cool and musical accompaniment. Off a small side track, 70-foot Taranaki Falls dropped into a startlingly lovely little gorge flashing rainbows on the striated walls. Then, at about three hours from the start, here came another side trail, this one marked Tama Lakes. Being fresh and excited, we took the bait and climbed above the heather and tussock and across a red-cinder landscape, first to a bench with brilliant blue Lower Tama Lake at 4100’, then on steeply up to a saddle to look down on Upper Tama Lake at 4725’. 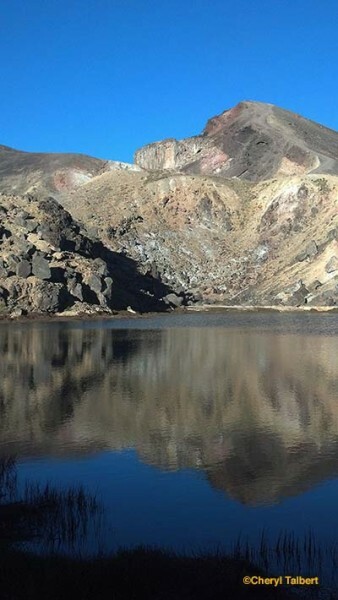 Both lakes occupy old explosion craters on the active line between the Ruapehu and Ngauruhoe volcanoes. The views were forever from here, to the dot of the Chateau to our southwest, the wide snowcapped massif of Ruapehu filling the frame to the south, and Ngauruhoe looming over the upper lake. Alas, lunch and views voraciously consumed, we now had work to do, miles to grind out, and grinding it was – another 9 miles and six hours of climbing and dropping, climbing and dropping, gaining elevation across successive gullies and moraines in increasingly barren lava-rock terrain. Finally, as the sun was beginning to drop toward the horizon, we dragged over the crest of a steep wall to finally spy our first night’s hut, Oturere, a tiny building on the edge of a deep ravine dropping down to the tumbling Oturere Stream below. These Tongariro huts proved to be a very different experience from the spacious huts on our South Island treks – so small that they fit just a few tables, gas burners and a sink in the modest common room, the sleeping bunks stacked right beside the tables, an outhouse in back. But Oturere was hopping – the tables were full of a young chattering crowd. We’d arrived during an extended drought so water had to be helicoptered out of the stream below. As usual we were the first to the bunks, earplugs and eyeshades installed to block out the festivity from the tables a few feet away. Our ulterior motive – a headlamp start the next day, on the most spectacular portion of the route climbing to the saddle, craters and lakes between Ngauruhoe and Tongariro. Now, with the cone of Ngauruhoe still glowing to our west, we climbed the first of the jumbled side slopes of the original Tongariro volcano, now blown into a wide scatter of smaller and larger cones, craters and red-black-orange rockpiles. Cresting the first ridge, we encountered Blue Lake – cold and colored true to name – resting tidily in its own crater. Sidetracking around Blue Lake and up the shoulder on its far side, the view vastly expanded. Close in, the smoking fumaroles from the November eruptions, and the track to the battered, closed Ketatahi hut; behind, the vast expanse from northwest to northeast including huge Lake Taupo – itself the product of the world’s largest eruptive event in the past 70,000 years, now bedecked with a lively resort town. 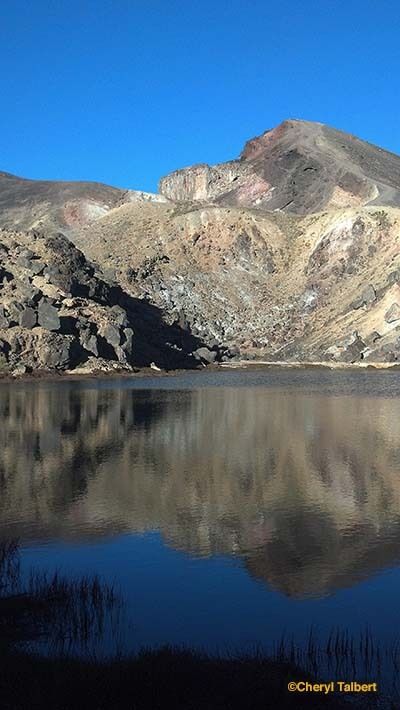 From Blue Lake, the Tongariro Northern Circuit turned west and scaled a steep pumice slope. To the left as it climbed, the trail passed a group of jade-green hot lakes – the ‘Emerald Pools’ – and then a vivid red and black crater cut in half by a pair of vertical silver-grey lava dikes – the ‘Red Crater’. Finally, cresting the slope, Ngauruhoe loomed right there to our southwest, its symmetric conical perfection a stark contrast to the jumble of Mt Tongariro’s high point, essentially just the remnant of its highest crater wall to our northwest. The bootpath up to the top of Tongariro yielded a perfect panorama encompassing all the terrain features we’d passed, as well as a classic view of Ngauruhoe and Ruapehu, barely offset one behind the other, and all the vast countryside of the central volcanic plateau of the North Island. From here – the high point of the circuit – the trail dropped precipitously, switchbacking down the scrabbly pumice-gravel to the very foot of Ngauruhoe. Looking up, the climb to its summit crater seemed impossibly steep and dangerous, though a string of people were already winding their way up. One person from our group set out to do the climb with a group of others, promising to meet us at the next hut. The rest of us continued on down and down, on track cut into the rock, descending into the valley of the Mangatepopo River. Finally, the valley flattened and the desolate rock gathered a cooling cover of scrub and trees. A side trail announced the way to Mangatepopo Hut, another cozy and lively building much like Oturere with outhouse and camps behind and the river splashing invitingly just out of view down a bank. We needed no coaxing to shed our packs and navigate down the bank to plop into the cool rushing channels and waist-deep pools of the river. Soon joined by our friend (who had found the Ngauruhoe climb to be much less treacherous than it looked, though definitely steep), we all ate our dinners of freeze-dried meals, powdered soup, bread and cheese and settled on the cliff edge just beyond the camps to watch an amazing scarlet sunset behind Mt Taranaki far to the west. That night, driven out onto the deck with my sleeping bag by the noise and heat of the little building, I was treated to a horizon-to-horizon Milky Way show with the Southern Cross and Orion on display, and several shooting stars zzzzzziiiiiippppping their way across the firmament. A fitting end to the primordial drama that is the Tongariro Northern Circuit. 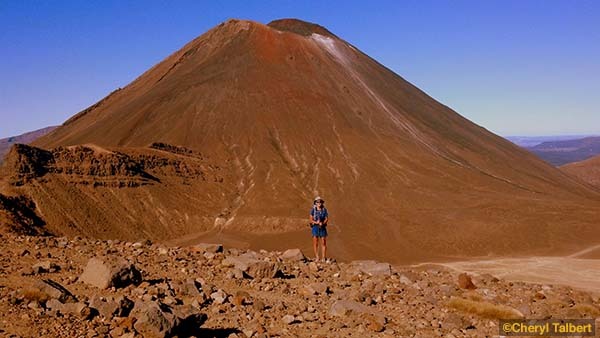 Tongariro Northern Circuit Standouts: Trek between three active volcanoes, with waterfalls and lakes scattered across stark and rugged lava-rock terrain. Climb Mt Tongariro, a red crater and emerald lakes far below and the perfect, steep cone of Lord of the Rings’ Mt Doom (really Mt Ngauruhoe) straight across from you. Booking Your Spot on the Tongariro Northern Circuit: Three well situated (but cramped) huts with adjacent campsites offer a range of daily distance and exertion on the circuit (we stayed at Oturere and Mangatepopo huts). 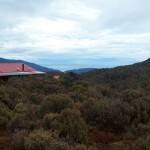 A fourth hut, Ketatahi, is closed due to volcano damage. Advance bookings are required for huts and camps – check 6 to 8 months in advance of your trip if you’re planning to travel between January and March. $32/night for huts, $14/night for camps. Getting to the Tongariro Northern Circuit: Flights are available from Auckland or Wellington to Taupo, from which you can rent a car or take a bus the short way to Whakapapa village (home of the Bayview Chateau and the trailhead for the circuit). Cars can also be rented in Auckland or Wellington and it’s a lovely scenic drive (but beware – they drive on the other side of the road!) Intercity Coach Lines and Naked Bus go from Auckland, Wellington or Taupo to National Park, a town near Whakapapa, with local shuttle services available for transfers up to Whakapapa Village or Mangatepopo trailheads.